Flooring can often be overlooked in many commercial and industrial buildings. But to ensure optimum productivity and safety, you need floors that facilitate the efficient running of your business. A popular option for many businesses is epoxy floor coating, thanks to its reliability and durability. Here, we explain more about epoxy flooring and the many benefits of installing it in your commercial or industrial space. The term epoxy refers to a combination of resins and hardeners which cause a chemical reaction when they are mixed together. The reaction results in a rigid plastic material formed of tightly-linked cross-polymer structures. This material bonds well to most base layers and creates a durable and highly resistant floor surface. Epoxy floor coating is applied as a liquid to concrete floor surfaces and then hardens to form a smooth, hard-wearing floor. The porous nature of concrete means that a bond is formed between the base layer and the epoxy coating, creating a strong and seamless surface. But, the coating must be applied by an expert commercial and industrial painting service. Only experienced professionals can ensure that the original surface is suitable and that the correct type of epoxy coating is used. Epoxy coating bonds seamlessly to your existing floors to create extremely durable, high-performance surfaces that will last for years. Epoxy floor coating is also very strong and resistant to wear and tear. This makes it perfect for commercial and industrial spaces as it can withstand the constant flow of forklifts and transport vehicles, as well as foot traffic from workers and customers. And, as it is resistant to sudden impact, accidents such as fallen cargo and spillages will not cause any damage to your flooring. The smooth, seamless surface that an epoxy coating provides is more forgiving on machinery than other types of flooring. This results in less wear and tear to the transport machinery, in turn lowering maintenance costs for your business. Due to its durable and resistant structure, epoxy coating can withstand continued exposure to harsh chemicals without becoming damaged or less effective. 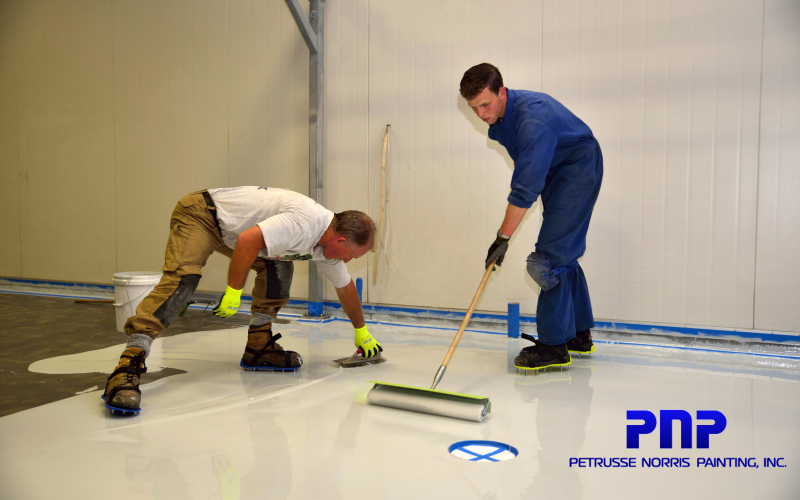 For this reason, epoxy floor coating is ideal for warehouses, pharmaceutical manufacturing facilities and industrial plants that may be regularly exposed to these kinds of components. Many business owners choose epoxy coating for its appearance as well as its functionality. An epoxy coating gives new life to old floors to create a shining, aesthetically pleasing surface. There are many different textures and colors to choose from too, so you can match your flooring with the chosen color theme of your commercial space. Because of the range of colors options, you can use different colors and designs on certain sections of the floor to create clearly marked designated zones. This is ideal for large spaces which need to include areas such as forklift paths, walkways, and loading bays. Being able to use epoxy coating to mark designated zones ensures the safe movement of vehicles and workers around your commercial or industrial space. But epoxy coating also has some specific safety features of its own. It is resistant to slippages, temperature, extreme and sudden impact, and even fire. And, epoxy floor coating also boosts brightness by up to 300% due to the way it reflects light. This means that your workers and customers will benefit from improved visibility, even in large industrial and commercial spaces. As a result, you can provide a safer working environment without the cost of installing additional lighting. Due to the crevices and pores found in other flooring surfaces, they attract dirt and bacteria and are difficult to clean. By providing a smooth, seamless surface, epoxy flooring is completely sealed and free from pores or crevices, meaning cleaning and maintenance is easy. Water and a simple floor detergent are more than sufficient to clean epoxy flooring and keep it looking like it's new. As well as being a great option for you and your workers, epoxy coating is also good for the environment in several ways. Firstly, the manufacturing process and materials that go into making epoxy coating are minimal and free from harmful substances. Cleaning your flooring is a lot greener as you won't have to use harsh chemicals to remove dirt and bacteria. The added brightness it provides means that large industrial and commercial businesses can save energy by reducing the need for bright fluorescent lighting. Since it is long-lasting, it means that you won't have to think about replacing it for many years, creating less waste. And, finally, as it helps to avoid the usual wear and tear on your vehicles, you won't have to replace tires and other parts as often, also resulting in less waste. Epoxy flooring is quick and easy to install, meaning that you won't need to shut down or stall production for long, saving you time and money. Although epoxy floor coating can be expensive, its durability alone makes it a great cost-effective option since you won't need to replace it for many years. And when you consider the savings on vehicle repairs, cleaning, and how quick it is to install, it's clear that it will save you even more money in the long term. Evidently, there are many benefits to installing epoxy floor coating in your industrial or commercial space. That's why businesses and buildings ranging from sports venues to hospitals, and from warehouses to car showrooms know that an epoxy coating is the best choice for their floors. If you're interested in epoxy flooring for your commercial or industrial space, get in touch with us today to find out more.